This book has been completely revised and updated especially to take into account the possible cancellation or revisions to NAFTA. It also reviews Canada’s other free trade agreements. It examines the outlook for exporting from Canada and some of the other factors that need to be taken into account including the price of oil; exchange rates and geopolitical factors. It reviews techniques that you can use to finance exports. This guide covers 314 government assistance programs, sub-programs and initiatives for exporting at both federal, provincial and territorial levels across Canada. It provides 704 addresses and websites to help you obtain further information. This guide also contains a chapter on sources of marketing and statistical information that will be useful to those who are already involved in exporting or are exploring the possibility of selling their goods or services outside of Canada. This book is an excellent introduction to export financing for Canadians. Iain Williamson is an entrepreneur, business consultant and seminar leader. His views have appeared in many newspaper articles. He has also been the guest speaker on a recent CBC Radio phone-in show on starting a business in a recession. In addition, he has appeared on television shows such as: CBC TV’s Venture; TVO’s MoneysWorth, and Canada Tonight of BCTV and CHCH Television. Iain knows the practical side of the import/export business and writes from firsthand experience, which he shares with you. His book is essential reading for every entrepreneur and business owner who wants to export from Canada. For fourteen years Iain has operated his own businesses in importing, high technology and manufacturing. He now operates Entrepreneurial Business Consultants of Canada and also owns a book publishing business which exports its titles to the United States and overseas. He holds degrees from Oxford University and from St. Andrew's, Scotland. 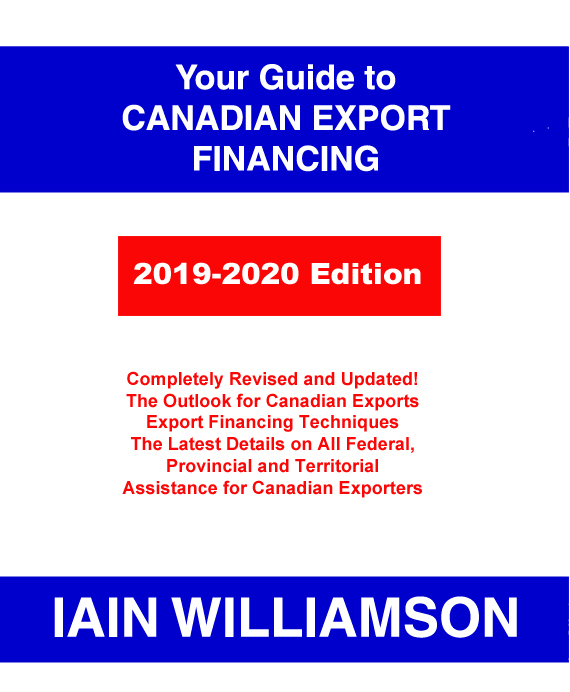 Your Guide to Canadian Export Financing: 2018-2019 Edition; by Iain Williamson; 268 pages; softcover; published in August 2018; ISBN 978-1-55270-801-9; ISSN 1191-047X; Canadian $69.95. Robots: Could they Throw a Monkey Wrench in Job Creation? Outsourcing: Could this Throw a Monkey Wrench in Job Creation in Canada?